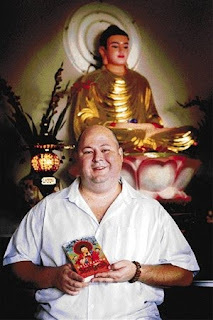 NEVER mind Kings Cross or Darlinghurst, Fairfield is the hub of cultural and religious inspiration according to Canley Vale author Walter Mason. 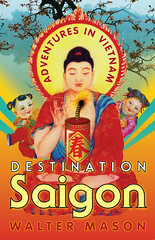 The 39-year-old released his first book, Destination Saigon: Adventures in Vietnam, on Monday. And while he hopes his humorous travel/religious book will usher in a long and bright literary career, Mr Mason flagged the end of popular city attractions as creative outlets. ``They are dead and docile,'' Mr Mason said of places like Kings Cross and Darlinghurst. ``This area is very inspirational. The real stories are in the south-west. Destination Saigon: Adventures in Vietnam is the culmination of a lifelong dream for the former North Queensland resident. Ironically, he spent many of his junior years working as a book seller. Now he has his own book on the shelf after a rigorous seven-month process. ``It is very exciting. 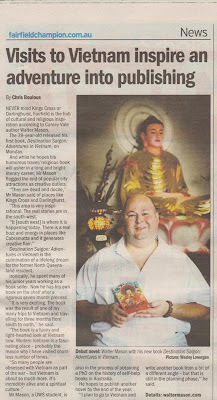 The book was the result of one of my many trips to Vietnam and travelling for three months from south to north,'' he said. ``The book is a funny and light-hearted look at Vietnam now. Modern Vietnam is a fascinating place probably the reason why I have visited countless number of times. Mr Mason, a UWS student, is also in the process of obtaining a PhD on the history of self-help books in Australia. He hopes to publish another novel by the end of the year. ``I plan to go to Vietnam and write another book from a bit of a different angle but that is still in the planning phase,'' he said.